I should really start this post off with a disclaimer because, for those who don't know me in person, I have this tendency to state my blunt observations with a dead-pan delivery. For some reason, I think people find it humorous, as a result, I've slowly embraced it as my comedic style. If you aren't used to my tone, you might think I'm being condescending. However, I'm merely just stating a neutral comment. I do not mean for it to be taken as fact. I do not mean to generate or perpetuate stereotypes. I simply feel like stating it because it's something I've observed. In this case, my sample size (n=4) does not generalize to the population at large, but rather, it serves as a mere scientific observation from my limited experience. They're observations I would freely share with my friends; I feel that if you're reading my blog, you're a friend to me. Due to my inquisitive scientific nature, I've always enjoyed visualizing trends. I did this in my biology courses in University when I began to notice that all of my ecology teaching assistants looked like the animals that they studied. One of my biology TA's studied bugs... he had this angular exoskeleton facial structure. Another TA studied polar bears, she had pale white blond hair with light blue eyes. Another one of my friends had a ecology TA that studied river otters. He was a scruffy looking brunette. I could not deny this observational trend. I have begun to notice a similar trend in conductors. Have you ever noticed conductors that look like... cherubs? 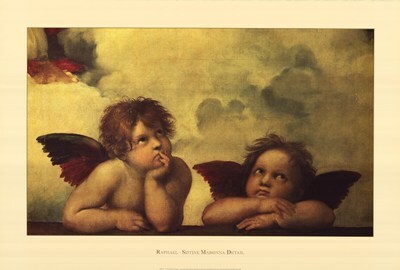 Is it just me or has anyone else come across a cherub-conductor in their musical experiences? You may simply state that there are many baby-faced people in the adult-world. Yet, I believe there is a higher concentration of them in the musical realm. Do I have any scientific proof to support my observations? Absolutely not! It's just a series of observations that have led me to form a subjective hypothesis. Personally, I think that cherub-conductors have a wonderfully loving and warm look to them. Who wouldn't want to look into the face of an angel during rehearsals? Technically speaking, those animals are putti, rather than cherubim. I appreciate the clarification. The change is noted.